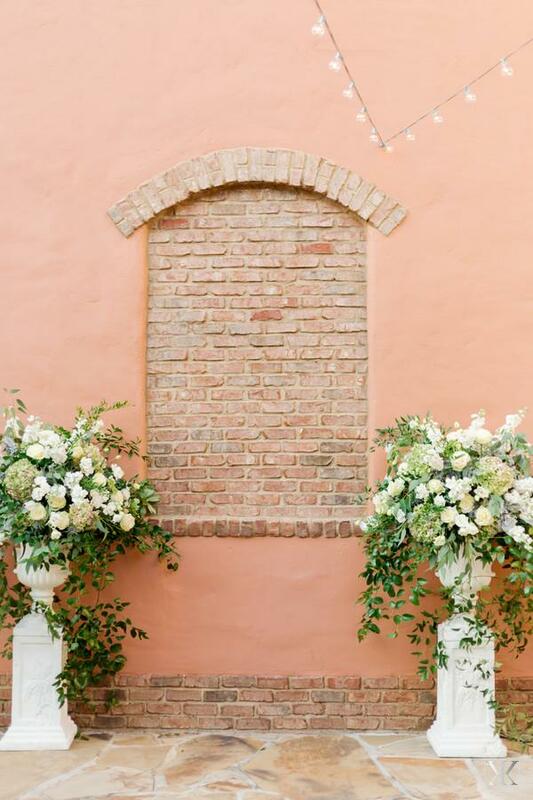 One may think that designing a gorgeous wedding day must consist of interviewing a variety of floral designers, scheduling a plethora of meetings throughout the planning process, looking over multiple mock-ups, and then selecting the exact flowers and look for the day. And sometimes, it is not. 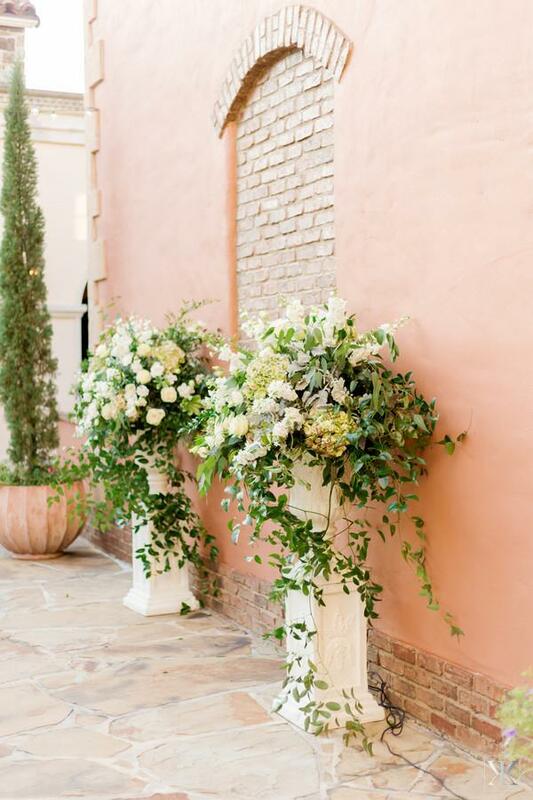 When it came to planning the floral romance and swagger of Jenna and Lee’s most special day at Bella Collina, it was anything but conventional. And it made all the difference. After receiving a rave referral from a friend, browsing over top reviews, and loving the pictures online, the sister of the groom called Fairbanks Florist and booked Lana and her team without Jenna and Lee even meeting her! 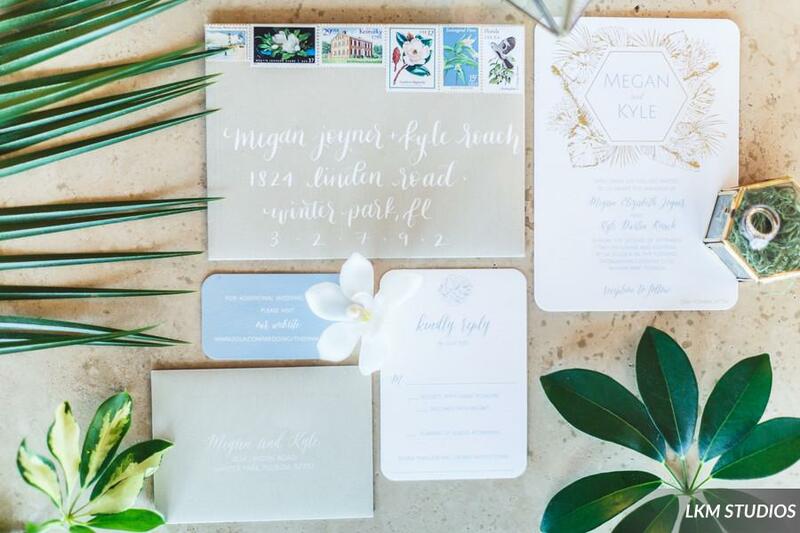 Throughout the planning process, Jenna sent Lana inspirational concepts via photos and Lana then interpreted the concepts into a unique look just for them - without meeting or speaking with each other until the week before the wedding. It may seem surprising to some not to meet with your wedding florist until the day of your wedding, but because Jenna and Lee trusted Lana to select the best quality flowers available and create a design that was inspired by their likes, but yet distinctly their own, Lana was able to make exquisite floral arrangements that exceeded all their expectations. The bridal and bridesmaid bouquets consisted of white anemones with rich navy hued middles, burgundy scabiosa, seeded eucalyptus, smilax, Brazilian berries, and roses. They were whimsical garden bouquets with delicate pops of stunning color. The groom and groomsmen donned white rose boutonnieres. For the ceremony, two large garden arrangements consisting of antique green hydrangea, smilax, roses, lisianthus, Italian ruscus, eucalyptus, and dusty miller created a beautiful altar area. 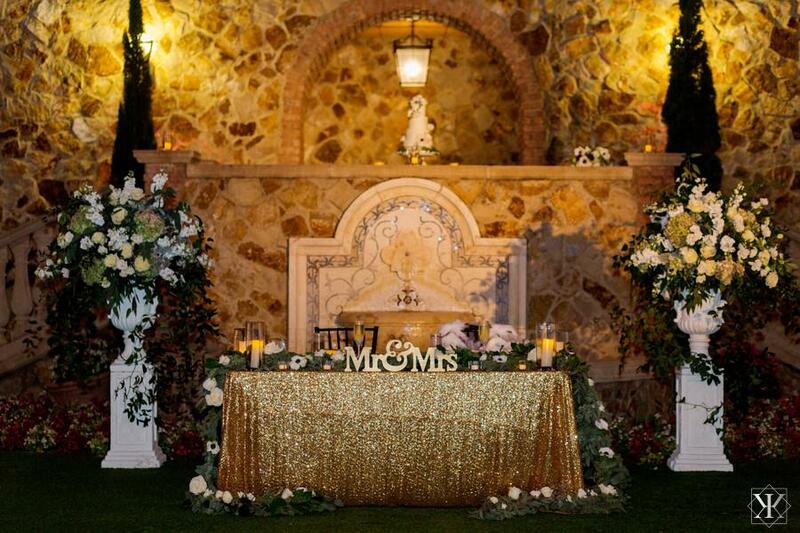 A variety of round and rectangular reception tables held lush garlands of greens with white roses interlaced throughout and the sweetheart table was absolutely breathtaking with the ceremony arrangements on either side, dripping garland on the table, candlelight and gold accents. Complementing the bridal bouquet, the cake showcased delicate decor. The reception simply glowed throughout the garden as guests dined among the candlelight. It was a night to remember. This wedding was the epitome of romance and to imagine…not one in-person meeting to make it all happen! We think that adds to the magic of it all. When Megan and Kyle became engaged in 2017 in Anna Maria Island, they knew a wedding in which their closest friends and family could attend and feel like they were truly on vacation was their dream. A theme of sophisticated paradise inspired by the Florida tropics would be the creative mindset behind the overall design. And Megan, a Floridian with Kentucky roots, loved the idea of blending southern charm with their Florida feel. and Lana made it all happen. With an abundant mixture of magnolia, tropical palms, and proteas, Lana designed the perfect blend of nature and elegance. But even though the design of the wedding was a dream come true, the weather that day wasn’t exactly what everyone had wished for. Wind and rain threatened for the outdoor ceremony time and eventually, the ceremony arch - which was drenched in magnolia, king proteas, and lush greenery - couldn’t withhold the foreboding weather any longer. Making a weather call to bring an event indoors even though the vision has always been for outdoors is one of the most difficult decisions to make on a wedding day. It was no different for Megan and Kyle. Eventually, they decided on an indoor ceremony, which was important for all of the wedding professionals involved as stormy weather can be dangerous for vendors - particularly for a florist on a steel ladder! The ceremony and reception ended up being an exquisite blend of southern charm and Florida paradise - even though the ceremony was indoors. And the magnolia flowers, which were silk placed in real leaves, stayed beautiful the entire day. It was truly paradise - both for the guests and for Megan and Kyle! There is no denying it…Jenna loves flowers. 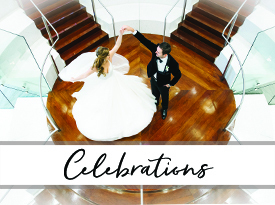 And pairing that love with the love her and Stephen share was nothing short of magical when it came to their wedding on January 12, 2019 at The Alfond Inn. The couple, who met in dental school and share a new practice, knew from the start that they envisioned a timeless, clean, yet modern look. It would be all white flowers with no greenery. Lana and their wedding planner, Andrea Grier of Weddings Unique, knew it would turn out to be the perfect choice for their garden backdrop as the white contrast within the greens of nature would be breathtaking. This structure was a quite a feat for the Fairbanks Florist team and one which would only get more purpose as the wedding continued. 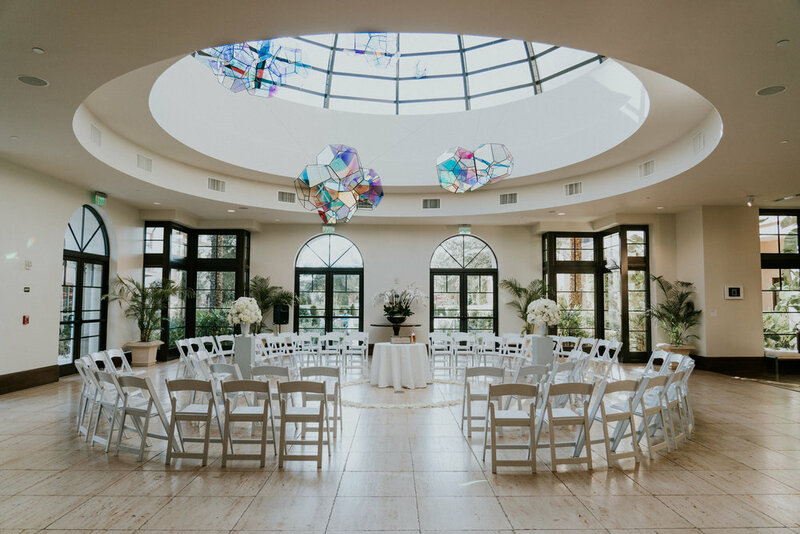 Designed to be taken apart in three sections, this skillful design allowed the square arch to be transitioned into the ballroom for the reception. Boasting itself behind the sweetheart table and providing an exquisite vignette for the wedding cake, this hydrangea-packed arch donned hanging crystals and candles with romantic drapery created behind it by Swag Decor for the reception - a complete wow for the couple and the guests! 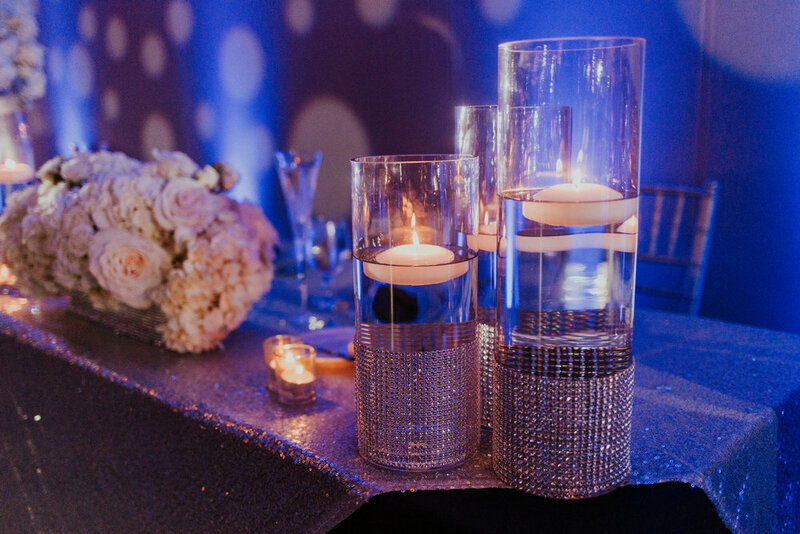 To complement this jewel of the reception, tablescapes consisted of white hydrangea and roses, uniquely detailed glass and candle pieces, as well as mirrors and crystals to give just the right amount of sparkle. The overall look was sleek, buttoned-up, and modern - yet, it all has a classic feel that will be awed for years to come. “After our first meeting with Lana we felt she listened to our wants and needs, she was on time, professional and brought her own ‘out of the box’ creativity to the table. 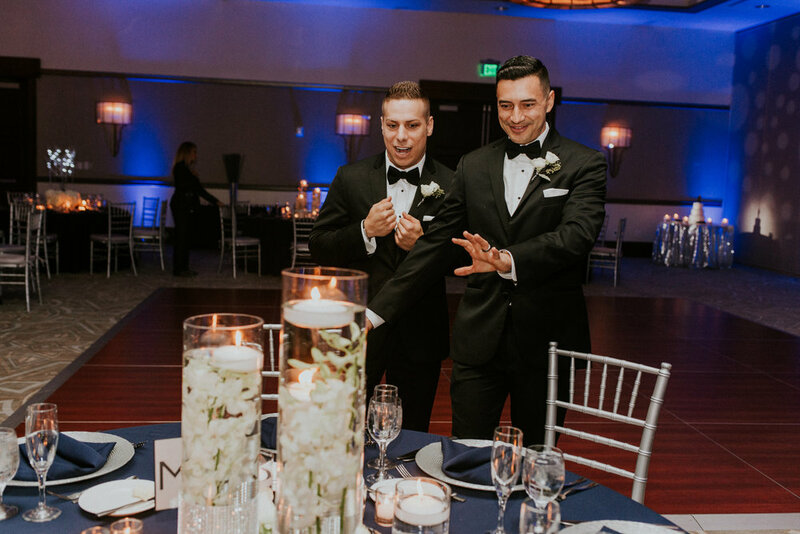 With their hearts set on a wedding design that revolved around two-toned blue orchids immersed in water complemented with manzanita trees, Anthony and Eddie set out to find the perfect floral designer to make their vision come to life. 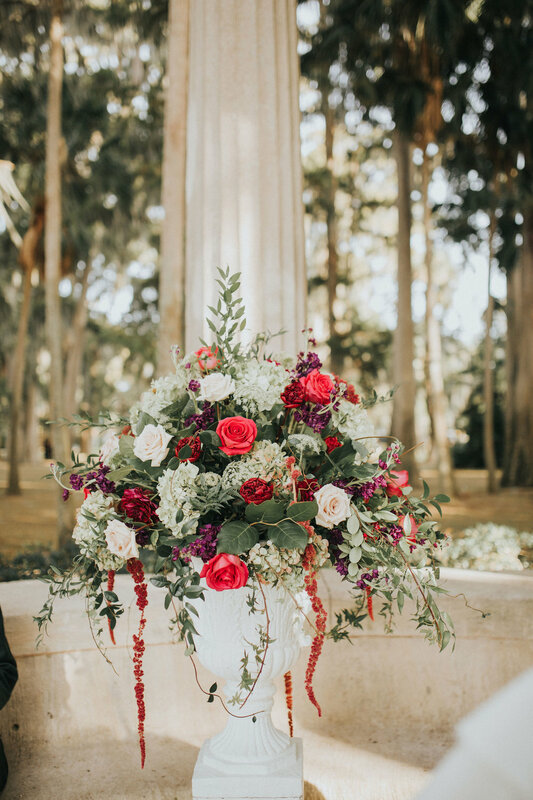 Embarking on their journey around Central Florida to find just the right designer, they eventually found themselves at Fairbanks Florist, creatively brainstorming with owner and creative director, Lana Faulkner. “At our initial consultation she had tons of ideas, suggestions and took the time to show us photos and materials on the spot,” say Anthony and Eddie. The talent that Lana showed that day, paired with her caring nature and desire to exceed all expectations, inspired Anthony and Eddie to trust her expertise when it came to their special day. Due to her keen sense of design and her getting to know Anthony and Eddie’s tastes, Lana recommended she create a sample of their requested centerpiece. 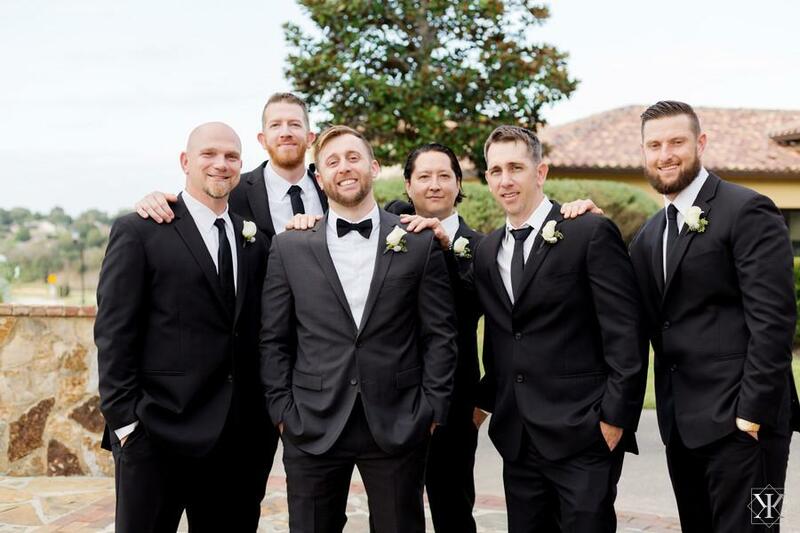 Although there was a cost for this (due to the hard costs of the flowers, the price of individual orders through a wholesaler, and the time it takes), Anthony and Eddie happily agreed to see their vision in real life before their big day. After seeing a mock-up version of their original thoughts, they knew there was something not quite fitting. Instinctively, Lana had thought that would be the case, so she had a plethora of fresh ideas influenced by the current design. A chic new version that was perfectly them! 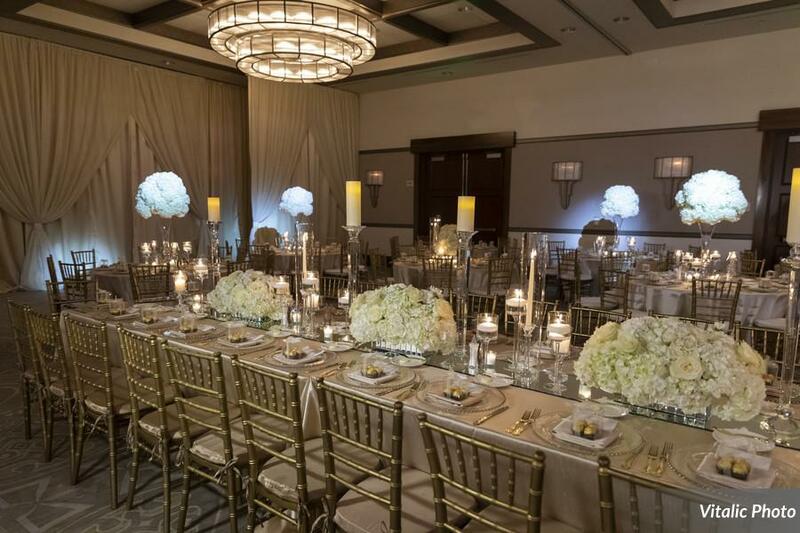 On a very special day in October, the Alfond Inn dazzled for Anthony and Eddie’s wedding. 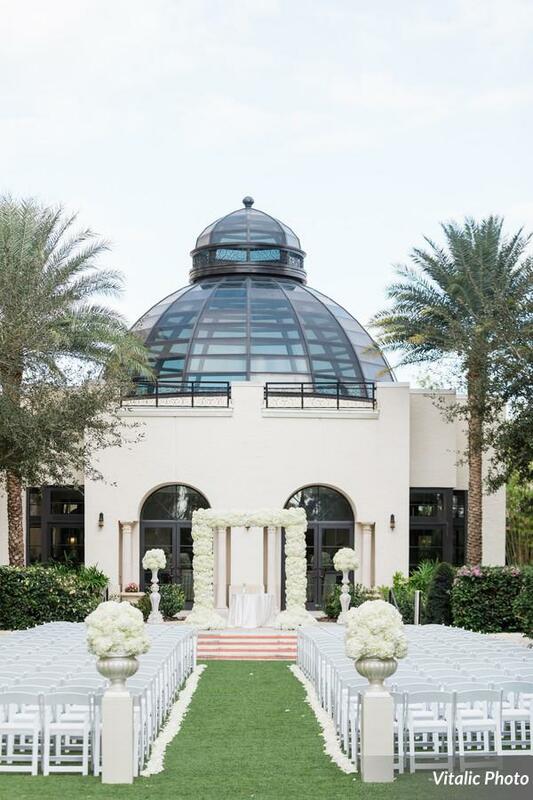 The ceremony in the Conservatory was beautifully set in a round with large white pedestals boasting full arrangements of white roses and hydrangeas. In the center of the room was a white circle of rose petals - simple and pure for the vows they would take. And while the ceremony was filled with airiness and natural light, their reception room was drenched in candles and specialty lighting. 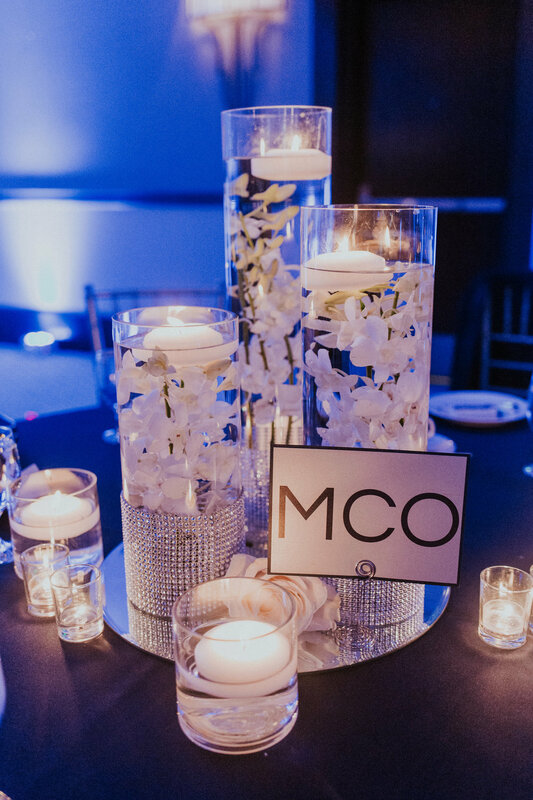 White orchids submerged in water-filled glass vases, manzanita trees with hanging crystals surrounded by a base of lush flowers, a sublime amount of sparkle enveloping floating candles and delicate white flowers, and exceptional lighting design by Wendy at Soundwave Entertainment made the entire room feel dreamy as each centerpiece was perfectly aglow. “The best piece of advice I can give to other couples in regards to design and flowers is to ask for a mock up version. I requested one for my wedding because I’m a very visual person and I was able to know right away what we had planned wasn’t how I pictured it. We quickly went back to the drawing board, brainstormed again, got more examples and were much more confident about the look we envisioned! If we didn’t do that mock up our wedding wouldn’t have been the same. Lana was positive and encouraging the entire time, even though we changed a lot of our initial plan. And what a pleasure it was working with these two open-minded visionaries on a wedding that was absolutely dazzling. From the very beginning, we knew this would be a special wedding. One can’t help but feel the love between Beverley and Jeff the moment that you meet them. When we did, we immediately knew this authentic, real love would create a wedding day that would fill everyone’s hearts. It would be our job to ensure the flowers and design would complement it perfectly. “After vetting several other florists, it was clear to me that Lana understood my vision, respected our set budget, and educated us on matters of all things floral. For my now husband and me, those were very important aspects when it came to deciding who we entrusted to bring our ‘greenhouse’ theme to life,” says Beverley. Working with event designer Lisa Stoner of Lisa Stoner Events, Lana set off to form floral elements that would bring the outdoors in at Beverley’s request. The selected DeVos Family Room at Dr. Phillips Performing Arts Center boasts floor to ceiling windows, creating a beautiful light and airy space. However, that openness devised a creative challenge for Lana to fill the space in soft, yet opulent fashion while enhancing the incredibly unique deconstructive U room layout Lisa had designed. This was no small feat considering the vastness of the stunning room, but Lana and Lisa successfully collaborated to soften the room with natural floral details that would bring it all together. The ultimate design selected by Beverley and Jeff were lush trees on white pedestals with hanging candles that stood along the aisle of their ceremony at Kingdom Church and then were transported to the reception to be placed throughout the 32 foot long tables that enveloped the room. Deep green garlands ran along each table with burgundy, pink, and purple flowers set into it. The look was made romantic even more with candles throughout the arrangements. Personal flowers were composed of white, light pink and burgundy flowers loosely gathered with greenery in garden style bouquets. They were exquisite alongside the eight bridesmaids in blush dresses. So what was it like working with Lana and the Fairbanks Florist team? "I’m a vibe person...if I can vibe with you, I’m pretty much sold, because the relationship aspect is the deciding factor for me. If you have an awesome wedding planner (like Lisa Stoner) they will help you gather a list of floral vendors who will most likely all be able to do the job. So when meeting with them, be aware of how they speak to you, how enthused they are to work with you, and whether or not you and your spouse feels comfortable with them. I firmly believe in trusting your gut." As a well-known local restauranteur, John knew his sumptuous Italian eatery, Francesco’s Ristorante in Maitland, FL, could be the perfect location to celebrate his marriage to Chocky. 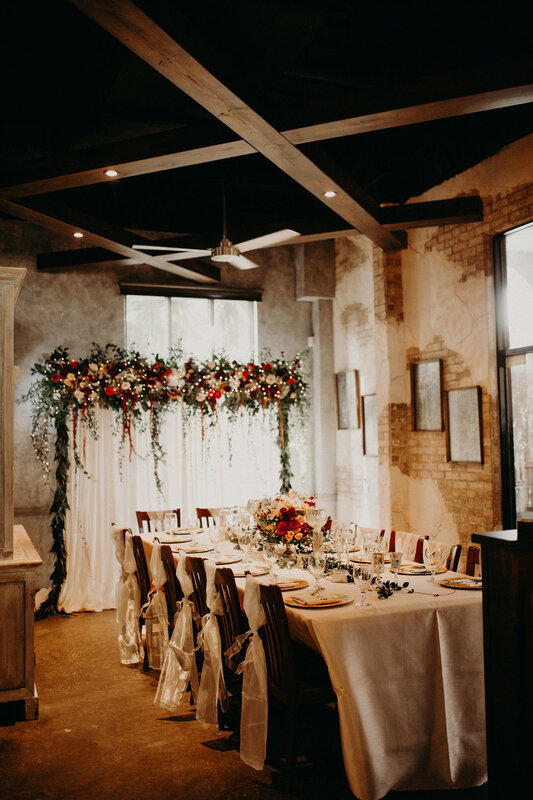 The food would be outstanding, the location was perfect, but the challenge would be how they could turn this traditional restaurant into an intimate wedding reception venue. However, Chocky knew just who to turn to. Friends for years, Chocky and Marelize Dingman (designer at Fairbanks Florist), had worked together on numerous charity events thoughout the years, including the Orlando Museum of Art’s Festival of Trees. Chocky knew Marelize held the talent and skills to exceed all expectations and immediately realized Marelize would be the perfect designer for their wedding. The ceremony, at Kraft Azalea Garden, was structured with two large, white pedestals, overflowing with ivory, peach, and deep pink roses, white hydrangea, dark red dahlias and peonies, thistle, burgundy hanging amaranthus, and flowing vines. Complementing these pieces and Chocky’s bouquet were miniature flower girl bouquets and matching floral halos. It was the perfect touch for the 5 flower girls! 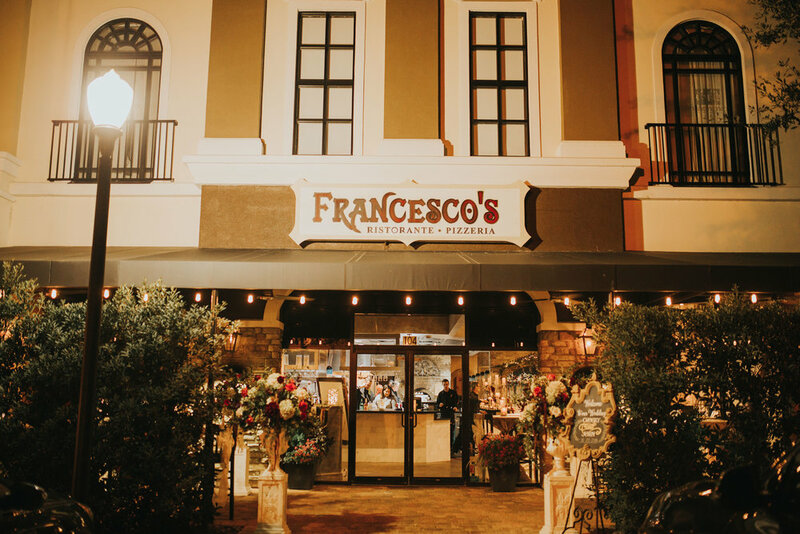 Back at Francesco’s, Marelize and the Fairbanks Florist team had transformed the restaurant into an upscale rustic environment with an unstructured garden design, boasting rich dimension, textures, and colors. Curry willow, grapevine, and manzanita branches were constructed into specially designed pieces for above the restaurant’s arches. They were created at the floral shop and completed during installation with fresh floral and hanging crystals. Tables lit up with romantic candlelight, donning sophisticated arrangements. And behind the head table, Marelize designed a floral header board with cascading drapery to bring intimate attention to the bride and groom. The ceremony floral arrangements were brought back to the reception, completing the overall look. John and Chocky’s wedding was a stunning affair that Fairbanks Florist, particularly Marelize, made uniquely exquisite. It was so well-received, that many arrangements (such as the arch decor) stayed for the holidays! Additional holiday decor such as decorated trees, were brought in to the restaurant as soon as the wedding was over and Francesco’s opened the following day perfectly ready for the holiday season! 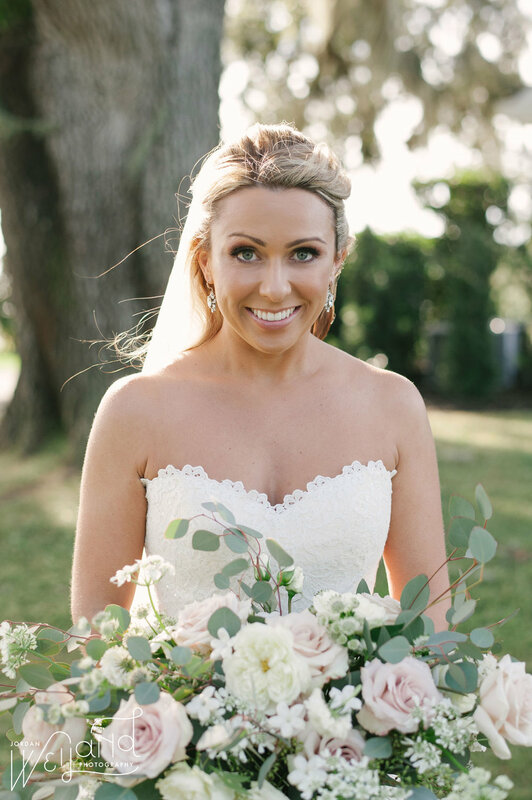 When renowned Orlando wedding planner Michele Butler, of Michele Butler Events, brought Melissa and Isaac to meet with Lana at Fairbanks Florist, it was truly a match made in heaven. She knew they wanted to make a splash with their wedding and Lana’s vision for floral and decor was one of the ways they would do just that. Taking just a few elements (inclusive of white and light blush pink roses, hydrangea, and calla lilies) and using them in abundance was the strategic design for Melissa and Issac’s Four Seasons Orlando wedding. Their outdoor ceremony was staged with an ivory rose petal aisle and cream, rectangular pedestals with lush arrangements filled with hydrangeas and roses that popped amongst the natural green foliage. Melissa held a tightly packed bouquet of light pink roses, blush hydrangea, and white calla lilies - an extra element that made her and her bridesmaids bouquets stand out from the other floral. Issac donned a boutonniere of two small white roses accented by gold wire and a touch of greenery. This abundant, clean, and classic design style became even more bountiful at their reception, when guests were greeted with layers of soft white fabric surrounding the room that was filled with lush, white and blush arrangements with gold accented chairs and table details. Lana designed the entire room including the layout, drapery, table elements, cake table, and the sleek white dance floor with the couple’s initials. She even accented the custom made seating chart with graceful drapery and fresh floral. However, the highlight of the evening was the unique curved sweetheart table that was drenched in their wedding flowers - down to the floor. What a WOW! It was truly a floral wonderland. There’s nothing that celebrates love quite like a New Year’s Eve wedding and Lindsay and Dustin’s Tuscawilla private home affair did just that. As the sun shone perfectly through the trees that last day of 2017, the setting was perfect for a ceremony under a family-made wood arch that Lana accented with roses, hydrangea, and olive tree branches. Lindsay carried a complementing bouquet with muted soft tones and Dustin donned a matching boutonniere. When day turned to dusk, guests retreated inside where the main living space had evolved into a reception for royalty. A variety of roman, circular, and square tables filled the room in which layers of design materials graced each one. Some tables boasted eucalyptus garland with rhinestones, pandora vine, and olive branches while others showcased a beautiful arrangement of smilax vines, dusty miller, wax flower, lisianthus, quick sand roses and hydrangeas in blush tones. But no New Year’s Eve wedding is complete without a little sparkle - and the mercury glass candle holders, gold glitter tablecloths, and gold beaded chargers added the perfect touch to the dazzling wintery look. As the new year drew closer, guests danced the night away around the outdoor pool in which Fairbanks Florist gave a glowing feel with fairy-light filled lanterns and greenery garlands with twinkle lights that surrounded the pool. It was a new year’s that welcomed 2018 with love and happiness - and one that will not be forgotten. The Spanish moss slightly swaying in the crisp fall air. The privacy of a grand estate built in the 1940s. And the beauty of two families coming together for one celebratory day. It was the perfect surroundings for a perfect day. Working with Lisa Stoner, of Lisa Stoner Events, Erin and Clay had a vision of a charming Florida estate wedding. The ceremony would take place overlooking the lake and the reception would have a charming garden style design. Set in the backdrop of the Adams Estate on Lake Alfred, hues of pink, salmon, and deep burgundy gave the wedding dimension and moodiness. 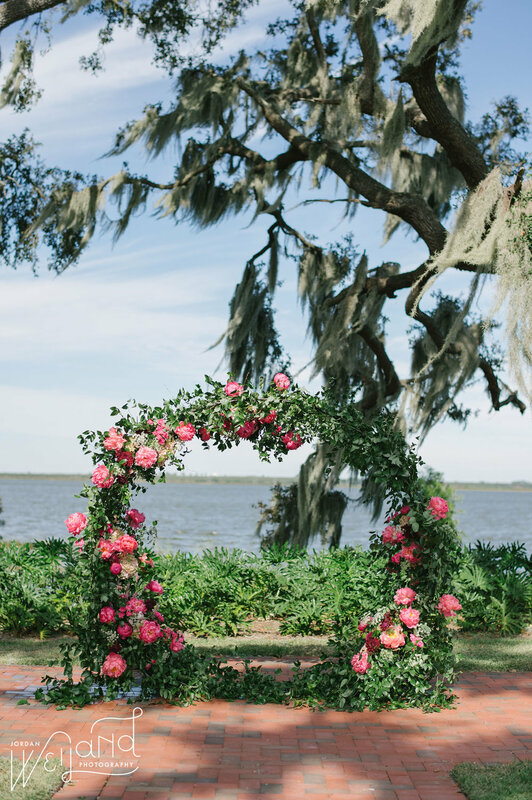 A large, circle arch naturally designed with a growing trellis of roses, peonies, dahlias, and greenery created a unique ceremony backdrop - a stand out amongst the old trees and calm lake. And this structure would not only be a highlight of the ceremony, but would be a stand-out piece for the cocktail reception and dance floor after it was carefully moved by the Fairbanks Florist team. 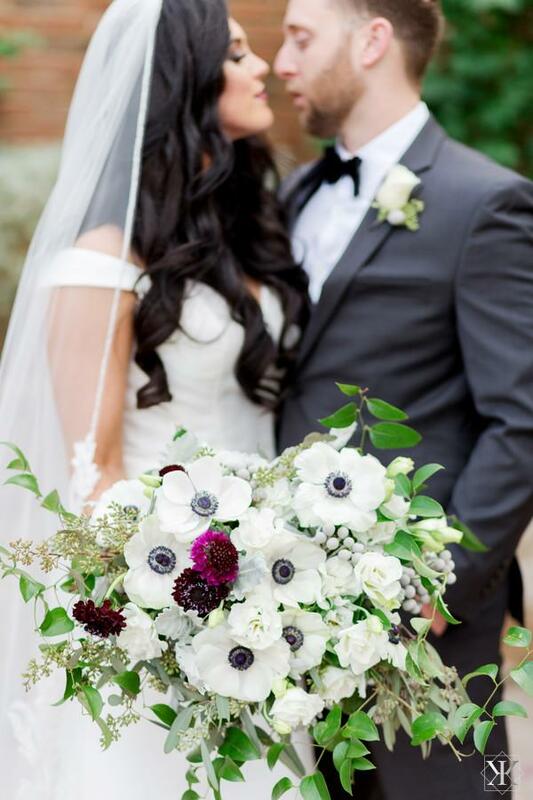 Erin carried a muted bouquet of wildflowers and stephanotis (one of her favorite flowers) for a whimsical, unstructured look that would give way to free-form design for Lana. It gave Erin a look of delicacy and romance while not taking away from the beauty of her dress. The reception inside the estate was filled with low-height floral arrangements of roses, peonies, magnolias and a variety of crystal and cut glass from Lana’s admired collection. It was the perfect look to create the southern charm feel. And to bring in Erin’s love of Florida citrus, bright tangerines were sparingly placed throughout the room. 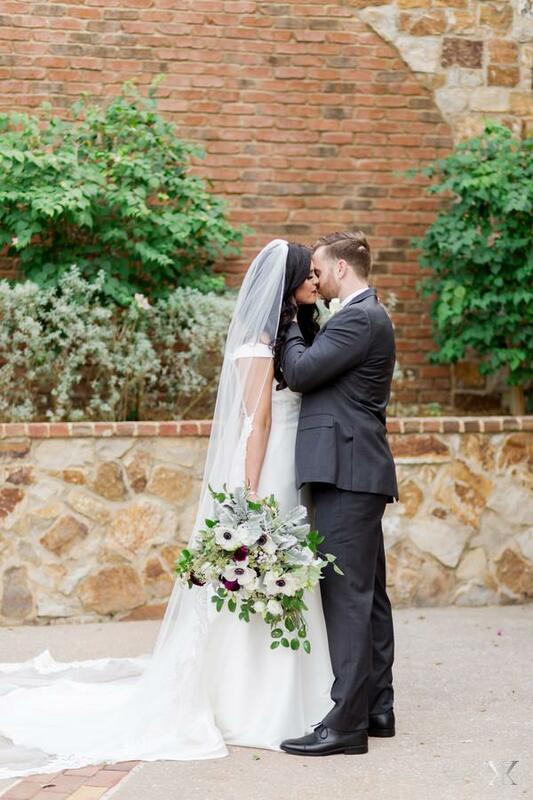 We loved the quaint charm of Erin and Clay’s special day. It was the perfect blend of unstructured design that brought a cohesive and relaxed feel to the day! As Lana pulled up to the Bramble Tree Estate that November day in 2017, she was anxious to get designing. Not only did she have beautiful, unique pieces with her that Megan and Kevin had purchased themselves, but she had luck on her side when going to the floral market. 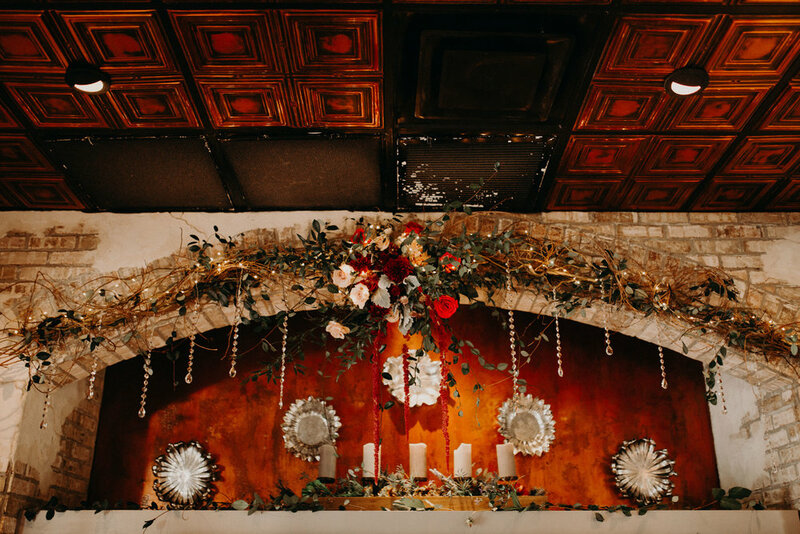 Her inventory included a plethora of rich reds, delicate pinks, and the most stunning hanging amaranthus she had ever seen - all waiting to create the perfect upscale, rustic, and vintage look. It would be a wedding design dream - both for her and for the couple. The flowers weren’t to be wildly extravagant and ornate. They were to create the feeling of soft, vintage-inspired chicness in a spectacular country estate setting. But even though the flowers weren’t to be overdone, it did not mean they would be understated. Rather, the flower design Lana would create would perfectly fit into the environment the couple selected. It would have an elegant abundance like no other. 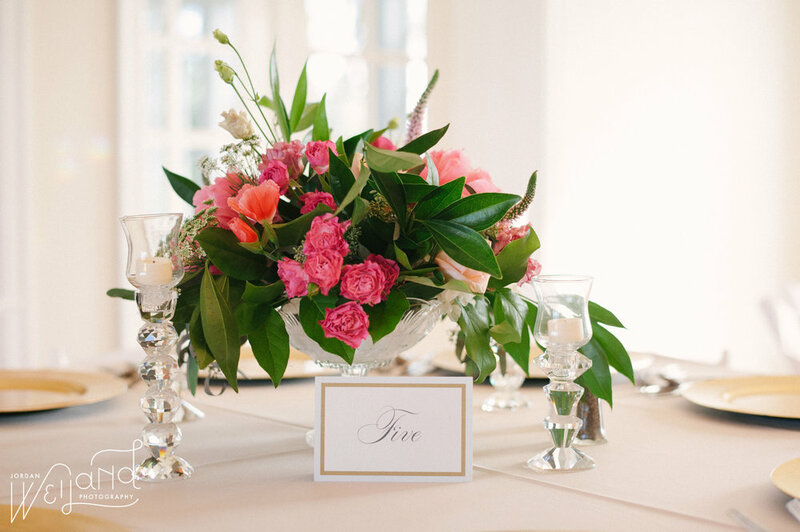 The selected color palette, choice of flowers, design freedom Megan and Kevin provided Lana, and the collaboration with The Busy Bee Events and Design would prove to be the perfect combination for a wedding that would wow. Without the bride knowing the bouquets would be adorned with hanging burgundy amaranthus, Lana made sure to have a plan to remove it if need be. However, it wasn’t needed as Megan was absolutely crazy about how beautiful the bouquets were. Her trust in Lana had reaped its rewards and in effect, she and her bridesmaids carried one-of-a-kind designs that were standout pieces throughout the day. Megan and Kevin were deeply involved in the planning of their wedding and purchased a black wrought iron arch for their ceremony. After brainstorming with Lana, the arch would be painted gold and accentuated with whimsical greenery and flowers, creating an eye-catching vintage elegance in a country chic setting. Unique details at the ceremony made a big impression in creating the overall feel of the day. Light greenery attached to garden ceremony chairs, floral highlighting a welcome sign and table, and living room vignettes complete with complementing floral filled the day with the utmost sophistication and romance. Continuing to awe guests, a lighted tent with varying tables was the perfect setting for dinner. 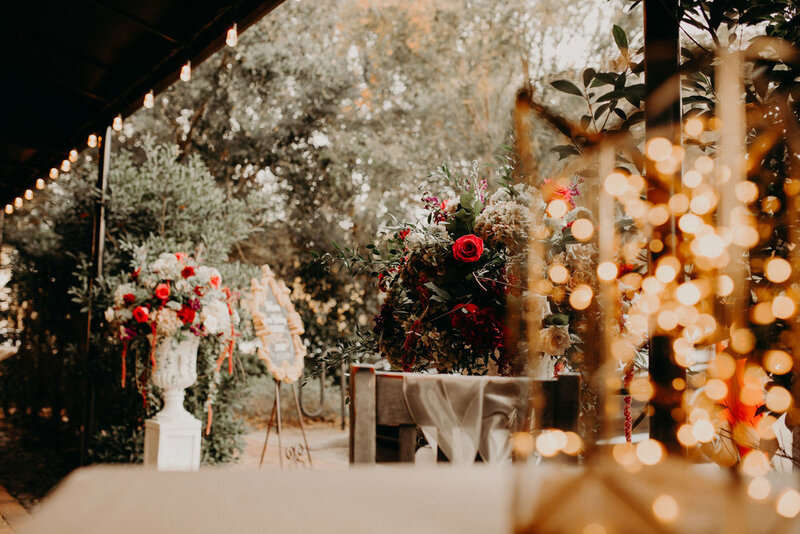 Because the ambience of the tent on the impeccable grounds was so charming, the flowers were designed to highlight the brilliant color palette of red, burgundy, and pink in long rows and amongst candlelight to make a graceful impact. In addition, a distinct cake table was the culminating piece of the reception. Displayed on an antique dresser with florals and greenery gently placed in slightly opened drawers, this piece was a draw for everyone. 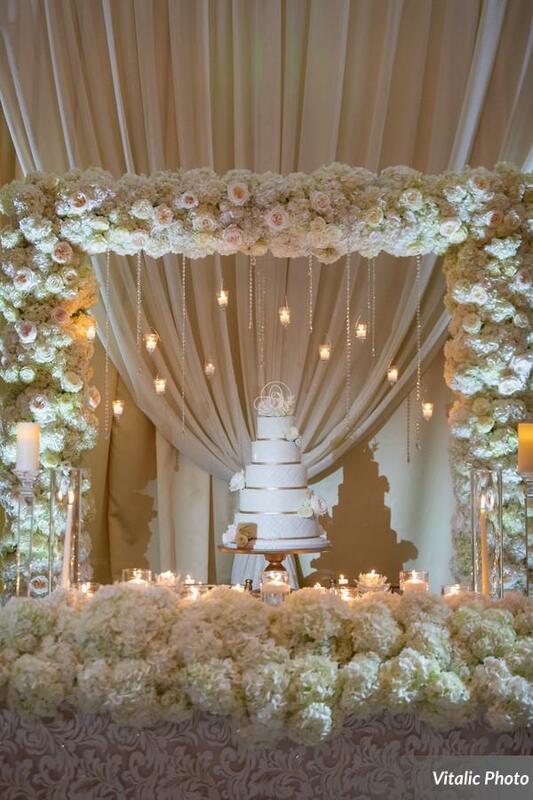 We particularly admire how the simple cake became glamorous in such a creative design space. Megan and Kevin’s wedding was a true testament to the concept of utilizing unique, bold colors and flowers to make a stunning impact. By giving Lana the creative freedom and flexibility to design from the inspiration they gave her, their wedding was simply inspirational. CLICK TO FOLLOW US ON INSTAGRAM!